NSDSP-1-U can program/debug PIC devices running at any voltage from 1.7 to 5.5V. - Easy - uses HID USB class and does not require any special drivers to operate. - Fast - several times faster than PICkit 3, and faster than ICD 3. - Safe - uses low voltage only and never applies high voltage to the board (HVP programming is possible with external circuit). - Can program and debug most Microchip PIC® microcontrollers. - A variety of free software programs can be used to configure and control NSDSP. The software can be used for development as well as production programming, including serialized or parallel programming. - Operating speed is configurable. If the connection between NSDSP and the target PIC device is good, you can use the highest signaling speed - 6MHz. If you need to use longer cable, or the connection is poor, you can operate NSDSP at lower speeds, as low as 50kHz. - Each NSDSP device has a unique serial number. This allows multiple devices to be connected to the host computer at the same time. 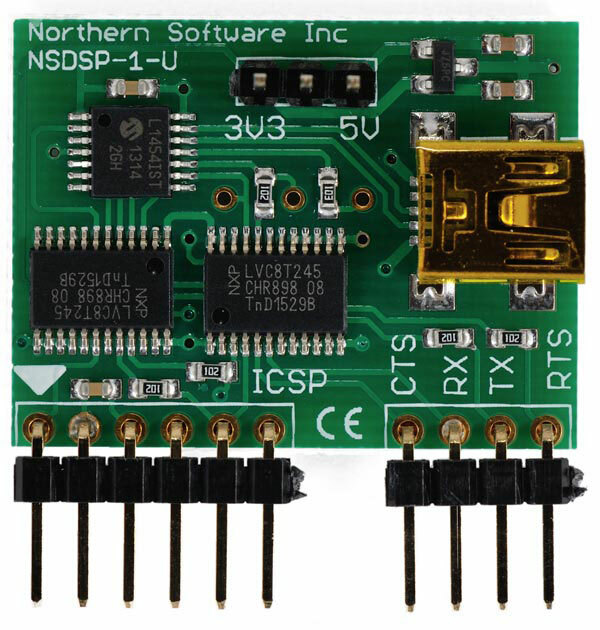 - NSDSP does not require firmware changes. The same firmware works for all supported PIC devices. - At run time, NSDSP can work as UART-to-USB converter for the target PIC (as well as for any other device) with speeds from 1200 baud to 2Mbaud. 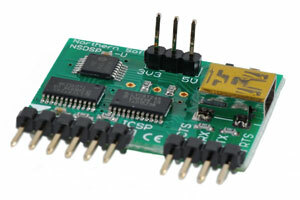 - NSDSP uses 10-pin connector designed to keep it firmly in the breadboard for prototyping. If breadboard is not used, a short cable can be used to connect it to your development board through Microchip 6-pin ICSP® connector. 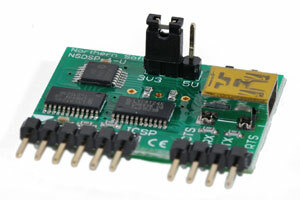 - NSDSP-1-U can work at any voltage from 1.7 to 5.5V. 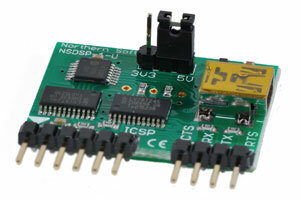 - NSDSP-1-U can power the target PIC device and provide up to 200mA of power at either 3.3 or 5V. To enable target powering, use the 3V3-5V connector. By default, a USB device is allowed to consume up to 100mA. If your circuit requires more than 100mA, you can configure NSDSP to request more power. - ICSPDAT and ICSPCLK pins cannot be put into high impedance state. Therefore, if you use PGC and PGD pins as inputs, you need to disconnect the programmer at run time. If you use PGC and PGD pins as outputs, you do not need to disconnect the programmer at run time, but keep in mind that the programmer's internal resistors will load these pins with 1kΩ load. In either case, the impedance of a device connected to one of these pins must be 10kΩ or more and this device must be able to tolerate high frequency signaling during programming or debugging. NSDSP-1-U ships with the jumper installed in 3V3 positon. When the jumper is in this position NSDSP provides up to 200mA of 3.3V power to the target device. At higher currents, because of resistance of PCB traces, the voltage will be lower than nominal. When the jumper is in the 5V position NSDSP provides up to 200mA of 5V power to the target device. At higher currents, because of resistance of USB cable and PCB traces, the voltage will be lower than nominal. When the jumper is removed, the target device must have its own power source, which can be anywhere between 1.7 and 5.5V. If the target device is powered by any source other than NSDSP, the jumper must be removed. Incorrect jumper position may damage NSDSP or the target device.